Occasionally we love to have some piping hot fruity oatmeal crumble for our brekkie on some cold mornings. 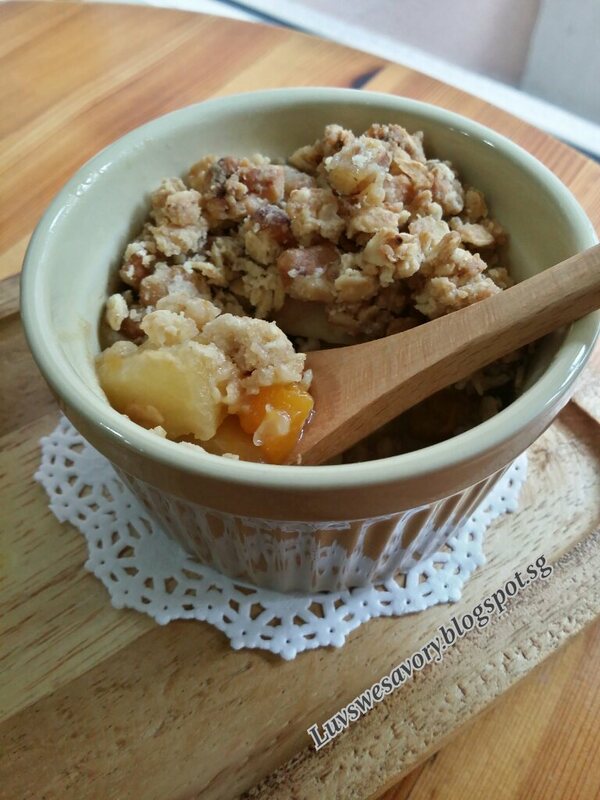 Chanced upon a crumble recipe with added stem ginger. 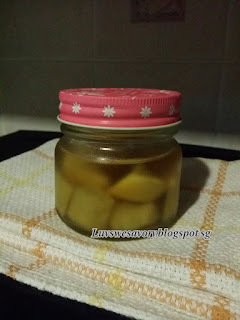 “Stem ginger refers to chunks of ginger candied and stored in simple syrup.” If you are unable to find ready stem ginger in the supermarket, it is not difficult to make one. I made a small jar of stem ginger in advance and keep it in the fridge. Glad that I could use the ginger or syrup for other bakes or desserts. Boil a small pot of boiling water, blanch ginger for about 10 seconds. In a small saucepan, add blanched ginger, water and sugar. Bring to the boil then reduce the flame and simmer for 15-20 minutes until the water and sugar forms a slightly thick syrup similar in texture. Pour into a container, let cool and keep in the fridge until ready to use. Below my slight modifications made. Position the rack in the center and preheat oven to 180°C. (Note: The temperature of the oven may vary, do adjust accordingly). Lightly grease 3 ramekins with butter and set aside. In a small saucepan combine all the Ingredients A and cook with low flame for about 5 mins. Stirring occasionally. Cook till apples are just tender. Off the flame and stir in the mangoes and stem ginger. Spoon the fruit mixture into ramekins. Combine the flour, light muscovado sugar, rolled oats in a big bowl. Use your fingertips to rub the butter into the mixture until the mixture resembles breadcrumbs. Stir in the walnuts. Spoon the crumble mixture over the fruit mixture. Bake at preheated oven 180°C for 20 minutes or until golden brown. Need to be careful while having this piping hot brekkie that's served straight out from the oven. 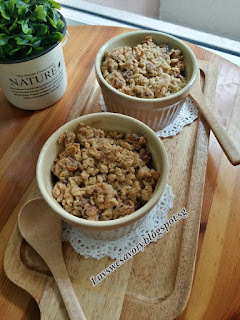 Very satisfying ... fruity, nutty warm crumble with a hint of woody spice flavour. Enjoy ! My note: Will add more stem ginger for more gingerly taste in my next crumble bake. 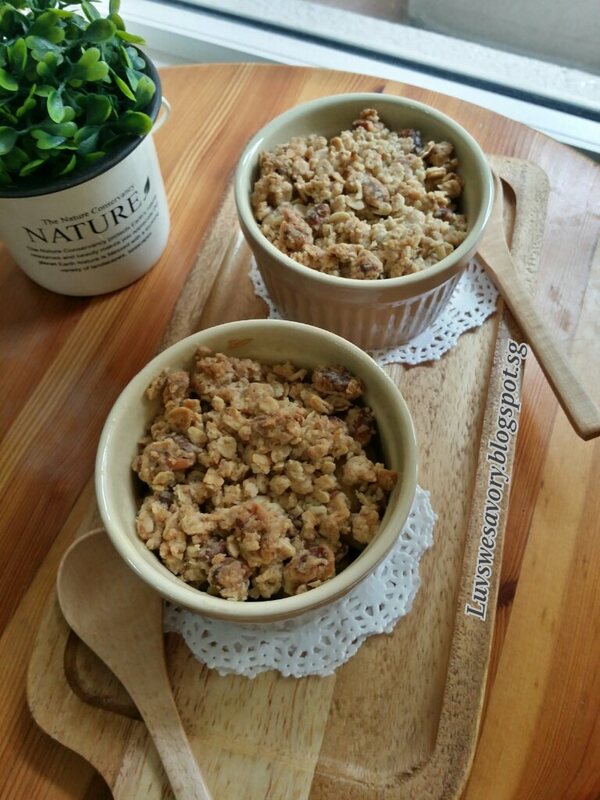 Thanks for the stem ginger recipe, and that crumble too! This is lovely, Karen. The yummiest breakfast.